This month our blog party is being hosted by the multi-talented Sarah over at Tales of a Kitchen Herbwife with the topic of Flower Remedies. A flower remedy is a very subtle form of medicine that works on shifting mental and emotional patterns which may be the cause of unhappiness or physical ill health. The flower is infused in water, usually in bright sunlight, and the resulting remedy is thought to contain the beneficial qualities of that flower on an energetic level. Flower remedies tend to divide herbalists into two camps as there is no accepted scientific rationale for how they work. It’s possible this may change at some point however as we discover more about such things as the memory of water and the effect that subtle energetic signatures can have on the healing process. In Masuru Emoto’s inspiring book, Messages from Water, he records images of the crystals formed from samples of water exposed to different words, images and music amongst other things. One of his experiments involved exposing water to chamomile and fennel and the resulting water crystals give us a fascinating insight into how flower remedies might possibly be working with us. Crystals from water exposed to chamomile. Crystals from water exposed to fennel. For now however I content myself with the fact that flower remedies seem to work well for many people and that I myself have experienced a huge amount of benefit from their use. Flower remedies are a subject close to my heart as they are really where my journey into plant medicine began over a decade ago. I discovered the Bach flower remedies in my local health food shop and began reading and studying about them and slowly adding each remedy to my collection. I also began making my own remedies from flowers in my parents’ and neighbour’s gardens. I still have a bottle of the first essence I ever made, a spring daffodil remedy, though I have not used it in years. From the Bach remedies I went on to using the Bush remedies which I studied both here in the UK and in Australia when I was in my early 20’s. Nowadays I mostly use a series of essences I have made over the last 5 years or so from local wild flowers along with some Bach remedies from Healing Herbs and tree remedies from Green Man Essences. We all know the joy of looking at a flower in bloom, it can dispel our feelings of gloom or despondency and make the world seem a brighter place. This is a subtle kind of healing, our presence and conscious awareness of the beauty around us in that moment shifts us away from negative thought patterns. For me, flower remedies work in a similar way. When we take a few drops on our tongue, we are imbibing something of the beauty and unique qualities of that flower which can help replace the vibration of fear or anxiety with a moment of clarity and peace. This is why flower remedies are said to work better if you take small doses frequently rather than fewer, larger doses as each time we take a small amount we are shifting ourselves away from the negative state. If we continue to do this over a matter of weeks or months then the more positive state becomes habitual for our minds. The mind is a creature of habit and the more we replace a negative thought habit with a positive one, the more natural it will become for us. Early in the year, whilst hanging out with my favourite Elder tree, I received a clear impression that this year I should focus on making moon remedies, that is flower remedies infused with moonlight rather than sunlight. I loved this idea and have been impatiently awaiting the few clear nights we’ve had around the times of the full moons. This last fortnight has seen me make two new remedies, one by sun and one by moon. 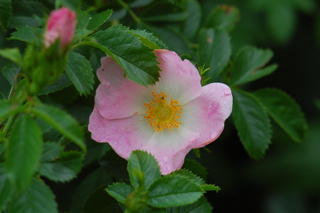 First was a Wild Rose remedy. 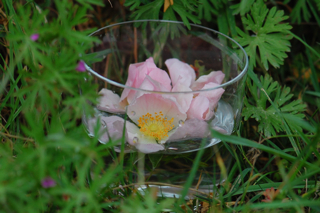 Roses are one of the most joyful sights of the English hedgerows, the ones around us have been spectacular this year, and roses are a flower I never tire of making essences from. 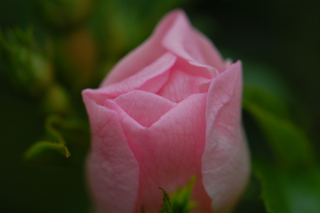 Rose is of course the flower of love and all rose remedies will open and heal the heart in some way. 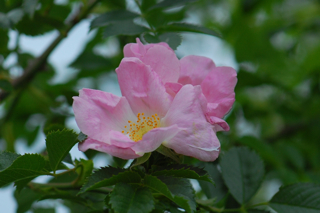 I find the wild rose has all the simplicity, joy and innocence of youth and as such it helps to bring us back to a time when love was a more natural way of being, rather something we had to strive for. With all it’s prickles and tendency to ramble where it will over the hedgerows there is also much of the resilience and fearlessness of youth about this plant which is common as a weed but still carries a rare ethereal beauty. I also find it a very spiritual remedy, helping to clarify and lighten my awareness and facilitate meditation. This remedy was made using the sun method which I have explained in detail here. As I was working the next day I decided to leave it out all night, collecting it after three hours would have meant too little sleep for me to be able to function! So I gathered it up just as dawn had broken. I don’t think any of the neighbours spotted me at this early hour, rummaging about on my knees dressed in my husbands boxer shorts and T-shirt but, if they did, it will no doubt only confirm what they suspect already. The moon’s energy is so different from that of the sun that the resulting remedy, though similar in many ways, felt like it had a different mode of action. It felt more softly diffusive than the solar remedies, not so distinct in its properties but like it slowly seeped through onto the different levels of being. 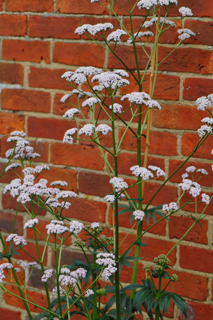 The leaves of Valerian are dark, moist and dense yet the flower heads grow so tall and upright. 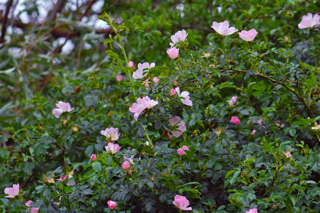 They seem very strong and vital yet the individual flowers themselves are the softest and palest of pinks. To me it seems like a remedy which helps us to rise above negativity and transform dark thoughts into clarity, understanding and love. One of the aspects attributed to the moon is that of seeing clearly during the confusion and darkness of the night which would contribute to this facet of it’s healing qualities. 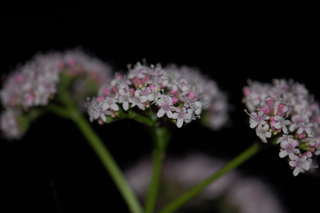 The Valerian flowers grow tall on fairly fine stems and the pale flower heads open up to the sky. The leaves however grow close to the ground and the roots are strong. 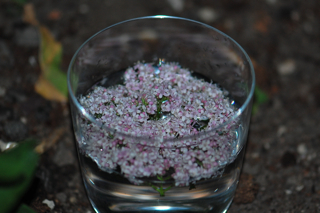 Reflecting these qualities I feel that Valerian flower remedy would be especially helpful to ground those who are spaced out or would benefit from being more rooted in the here and now. Flower remedies are a wonderful addition to any medicine chest. they can help to calm and centre, to inspire and uplift and they can be made from any flower that calls you. Dr Bach’s vision was that his system was simple enough for us all to be able to use to treat ourselves and our families. Flower remedies can also be used with pets and with plants too, watering well with rescue remedy is helpful for a plant that has been newly transplanted or is stressed for some reason. Don’t forget to read all the rest of the entries for this months flower remedy inspired blog party, the links to which will be posted on Sarah’s blog on Monday. A truly beautiful post, Lucinda. You have deepened my awe of this wonderful medicine even more, and I was especially moved by the photos from Masuru Emoto’s book – so profound! What a lovely idea, as well, making essences in the moonlight. There is a company here that makes an elderflower essence by the light of the midsummer’s full moon which is simply amazing! The moon certainly has it’s own healing energy, doesn’t it? – more subtle, mysterious and feminine I think. 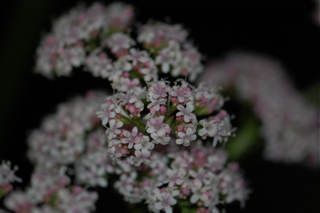 Valerian seems a perfect candidate for that soft energy. Hey Danielle, that’s so interesting, I am planning to do the same thing, a mid-summer full moon elder essence. I suppose it’s no surprise that others have made one before given elder’s associations with being whisked off to faery-land on mid-summer’s eve! I am amazed by your water pictures, I could never have imagined these effects. I also love your moon essences, what a beautiful idea, I would love to try to make one. 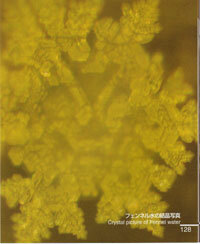 Emoto’s book is well worth a look if you are interested, it’s fascinating stuff. Do write a post if you make a moon essence, I’d love to read your experience of it too. Lucinda, what an incredibly moving post. I am a moon child…so I was particularly interested in the essence you made in the moonlight. Valerian is one of my favourite plants and grows well in my garden. 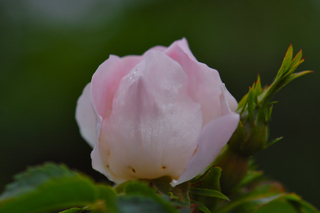 I have used Bach’s flowers for many many years and found them to be most beneficial. 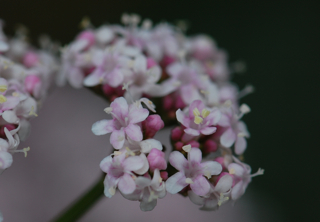 I can imagine the Valerian looking beautiful in your garden, the bees love it don’t they. Rain and Moon essence in progress here — Rain?